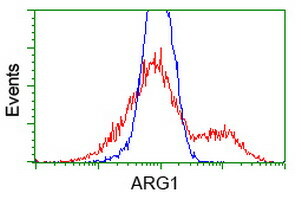 Mouse anti Human Arginase-1 OTI4E6. 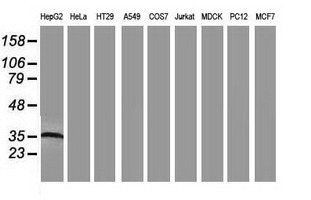 Full length human recombinant protein of human ARG1 (NP_000036) produced in HEK293T cell. Argise catalyzes the hydrolysis of arginine to ornithine and urea. 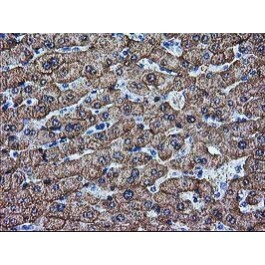 At least two isoforms of mammalian argise exist (types I and II) which differ in their tissue distribution, subcellular localization, immunologic crossreactivity and physiologic function. The type I isoform encoded by this gene, is a cytosolic enzyme and expressed predomintly in the liver as a component of the urea cycle. Inherited deficiency of this enzyme results in argininemia, an autosomal recessive disorder characterized by hyperammonemia. 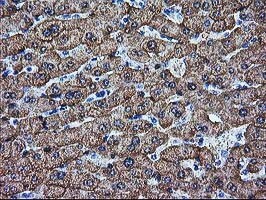 [provided by RefSeq].